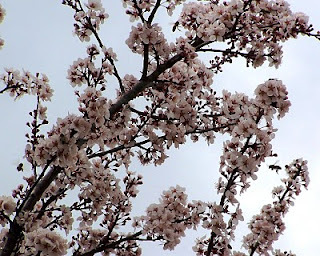 The plums are the first bright white-blooming trees to appear in the woods early in the spring. These members of the rose family grow in woodlands, fencerows, and old fields. The roses are important bee plants, providing ample amounts of nectar and pollen. There are numerous species of plums in the Mid-South including the wild plum and the Chickasaw plum, thought to have been cultivated by the Chickasaw Indians and early settlers. Many domestic plums have escaped into the woods, often forming thickets of white-blooming, low trees. Many of the domestic plums require bees to cross-pollinate the blossoms. The early bloom of the plums comes at an important time for honey bee colonies rapidly expanding their spring populations. After the bloom of the plums, a series of other fruiting trees in the rose family will come into bloom: pear, apple, cherry, peach, and crabapple. The almond tree, cultivated in California, is also a rose. All except the peach, which is usually self-fruitful, require pollination from bees to produce fruit. If you click on today’s photo, you can see honey bees actively foraging a plum tree. Some bees are collecting nectar, and others are collecting pollen. A report has been released which indicates that Colony Collapse Disorder still persists after four years of honey bee die-offs in the United States and Canada. The report reveals that continuing CCD losses coupled with a more severe winter than normal may bring record over-winter colony losses this year. The study found bee pollen and hives laden with pesticides. Many of the pesticides are systemic agents which are designed to be taken up by the plants and carried throughout the plant. It is felt that the systemic pesticides are brought back to the hive by honey bees foraging for pollen to feed to the brood. The report can be followed at http://news.yahoo.com/s/ap/20100324/ap_on_sc/us_food_and_farm_disappearing_bees. Hopefully, this and similar reports will make more of the public aware of the effect certain pesticides have on the pollinators. For a species to survive and prosper, it must be adapted to the environment; and the environment is constantly changing. Species of plants and animals that exist today are the ones that have changed to be capable of living in the presence of harsh environmental conditions, pests, and parasites. The mechanism for change is mutation. Mutation of genes means different traits will be passed along to the next generation. If these traits make it more favorable for the offspring to live, there will be more of the offspring in the population. This change in the numbers of individuals with certain traits describes how plants and animals evolve to fit into the changing environment. This population change is the result of natural selection. Humans can artificially select the characteristics that we feel are wanted by picking the individuals that we want to reproduce. 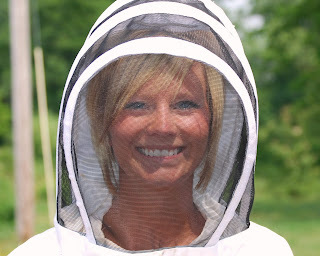 Beekeepers are doing this by selecting honey bees that are resistant to parasitic mites and other pests and pathogens. They are also selecting bees that are gentle and are effective pollinators and honey producers. Horticulturist Paul Little is selecting varieties of the succulent plant, sedum, which are well adapted to the environment in the Southern United States. His method involves attempting to grow large numbers of sedum plants and evaluating how well they perform in the region’s warm, humid temperate climate and varying soil conditions. Of course, many of the varieties that Paul tries simply die. They are not suitable in the region. Paul propagates sedum from the heartiest survivors. 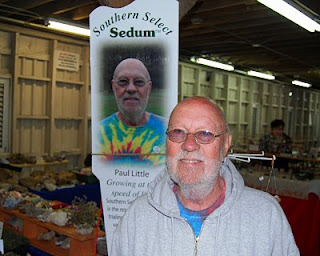 His plants are identified as Southern Select Sedum, and may be viewed at http://www.southernselectsedum.com/. The method of improving the survivability of either honey bees or sedum plants is similar. Honey bee producers probably have an advantage over sedum producers because the multiple mating of queen bees results in a numerous traits to select. Sedum plants are propagated by cuttings. The offspring plants from cuttings are clones of the parent plant without genetic differences to select. Beekeepers must balance the value of opening the bee hive and the damage that opening it causes. One of the decisions we make regarding the care of the bees involves how often we should open the hive and how much manipulation we should make to the bees’ home. In the presence of Small Hive Beetles, an Integrated Pest Management approach to beekeeping would likely involve minimal manipulation of the hive. The reason for this is that the honey bees have learned to defend the hive from the effects of the beetles by trapping the adult beetles and holding them in jails made of propolis or bee glue. The Small Hive Beetle is protected from the bees by a hard covering. 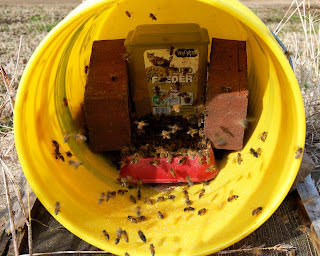 Click on today’s photo to see honey bees building Small Hive Beetle jails in a honey super. The workers are placing propolis along the ends of the frames to hold beetles as prisoners. In the picture a brown-colored adult beetle tries to escape. Its sensitive antennae are tipped with feather-like ends. To prevent breaking the propolis bonds that trap the Small Hive Beetles, we may make regular checks of the hives without opening them. Having large numbers of bees flying in and out of the hive and pollen being brought into the hive usually mean that we have a laying queen and bees are feeding larvae. Small Hive Beetles often hide in burr comb. We can remove hiding places by scraping beeswax from the top bars of frames. Using frames of drone comb foundation encourages the bees to not build burr comb. At times we can inspect a hive by removing a few frames from the upper hive body and look down into the lower box. We should not leave excessive amounts of equipment on the hive, as this provides good hiding places for Small Hive Beetles. We should also avoid hive feeder arrangements that drown bees; Small Hive Beetle larvae thrive on the protein of the dead bees. Lawns and open fields are covered with a low plant with pale purple flowers. This is dead nettle, a member of the important family of bee plants, the mints. 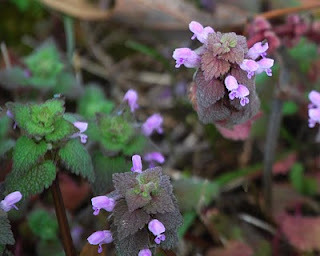 Dead nettle is often found growing in the same fields with its close relative, henbit. Dead nettle has rows of pointed leafs; henbit has a rounded, curly leaf. Henbit has a similar flower with a darker purple color. They can easily be recognized as mints by their square stems. While many of the mints can be identified by distinct aromatic odors when their leaves are crushed, dead nettle merely smells of hay or rich forest soil. Dead nettle is a cool season plant that will disappear with hot weather. If lawns are not sprayed with herbicides, the dead nettles serve as a good source of nectar for honey bee colonies starting their spring build-up. If you click on today’s picture, you can see a tiny solitary bee foraging dead nettle. I got a message today from an Arkansas beekeeper who discovered that she lost the queen for one of her colonies. It is fortunate that she has more than one colony to work with, because honey bees are not producing queens and drones in this region now. The colonies will be producing both in a few weeks, though. I found the first drone brood today that I have seen this year. Drones emerge as adults in 24 days, but they are not sexually-mature for about another 20 days. This beekeeper may need to combine her queen-less colony with a queen-right colony to protect the honeycomb until the bees are ready to produce queens and drones. If she lets the colony collapse from lack of a queen, hive scavengers will likely destroy the combs. Small Hive Beetles and wax moths eat the combs and contents of abandoned hives. Once the bees start producing queens and drones in a few weeks, she can divide her hive into two colonies. The end of winter and the beginning of spring find the honey bees eagerly searching for food for their expanding populations on any occasion that allows the bees to fly. The bees are in a period of population growth which demands considerable amounts of food; however, there are not yet ample amounts of food available from flowering plants. Adult bees can live on the high-energy carbohydrates in stored honey, but developing bees must have a complete diet. For good nutrition, the bees must have both honey and pollen. The pollen completes the honey bee diet by supplying protein, fats, vitamins, and minerals. The colonies are now consuming the last of their honey stores from last fall. Most of their pollen is being brought into the hive by foragers who seek out any flowers in bloom. The first warm days of spring bring foraging honey bees to plants that may not regularly attract bees. The bright yellow blooms of forsythia at times attract pollen foragers. 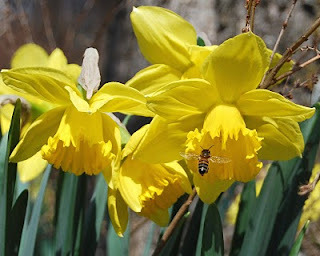 Daffodils are early-blooming perennial flowers that do not often attract honey bees. However, this week I found large numbers of bees foraging for pollen in daffodils. These flowers marked the location of a long-abandoned home site in the margin of the woods. The bees would fly directly into the large bell of the flowers’ coronas and emerge with pollen. While inspecting bees, I found the colony that held two queens on January 24 had died of starvation. I gave all of the colonies in that bee yard supplemental feeding at that time, and they consumed all of the syrup. It is likely that the colony with two queens laying eggs simply produced a population that could not be sustained by the available food. Beekeepers who want to produce a honey crop face a balancing act during the early spring. They must encourage the bees to build a large population to be able to exploit the large nectar flows while trying to avoid starvation and swarming. As a long winter comes to an end, opportunities arise for the beekeepers to open the hives for a closer inspection than has been possible so far this year. 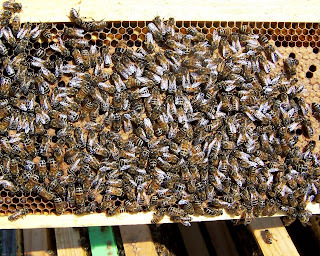 The frames can only be removed from the hive when the air temperature is warm enough to keep from chilling the brood. An inspection of a number of hives found the bees with strong, expanding colonies. Many of the colonies had consumed much of their honey stores. I feel that a number of the most populous colonies would have starved had it not been for late winter supplemental feedings. Many of the hives were also ready for a rearrangement of the order of the brood boxes. It is the natural tendency of the honey bee cluster to move upward in the brood nest over winter. The bees eat the honey from the cells above their cluster, and then they move into the empty area and use it for brood production. In cases where the brood was found to be in the very upper-most part of the hive, the lowest hive body was usually found to be completely empty of brood and honey stores. Often the bees will not move downward by themselves; the beekeeper must step in to rearrange the hive to provide brood space. If the bees can’t find adequate numbers of empty cells for the queen to use to lay eggs, they colony will begin a month-long set of preparations for swarming. Moving the lowest hive body to the upper position effectively moves the cluster of bees downward in the hive. The empty cells above the brood nest can now be used for brood nest expansion or storage of nectar being brought into the hive. For some of the colonies, this week brought the second rearrangement of the brood nest this year. Each rearrangement opens brood space and stimulates brood production. Click on today’s picture of nurse bees tending brood of mixed ages, including eggs, larvae, and pupae. The modern bee hive is a functional replica of the honey bee’s natural home, a cavity in a hollow tree. The typical honey bee nest has brood comb in the lower portion of the cavity. Layers of pollen and honey surround the brood, like the layers of an onion. Each sheet of comb in the brood nest is trimmed to the same thickness. Surplus honey is stored in the upper part of the cavity, above the brood nest. Stored honey is held in cells which may be drawn out considerably longer than those in the brood nest. This makes for some sheets of honeycomb that are thicker than those below. In the modern Langstroth bee hive, the surplus honey is stored above the brood nest in boxes called honey supers. They get the name, “super” from the fact that the boxes are “superimposed” or stacked upon one another. The beekeeper places frames of foundation in the supers for the bees to produce the honeycomb to hold the hive’s surplus honey. 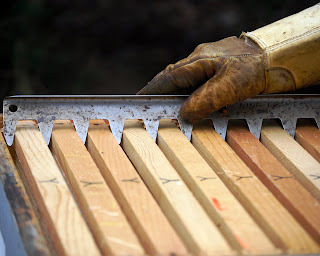 In keeping with the honey bee’s tendency to draw out more lengthy cells for honey storage, we often remove a frame to give the bees room to extend the comb. This allows each frame to hold more honey, and the beeswax cappings are exposed for greater ease of cutting the cappings and removing the honey at harvest time. The bees’ tendency is to build comb and store honey in the center of the hive. We can encourage the bees to use the entire honey super by placing frames of drawn comb in the outside positions and frames of foundation in the center. In the photo, I am spacing nine frames in a super capable of holding ten. Empty frames of honeycomb above the brood nest stimulate the bees to collect nectar and hoard honey. During strong nectar flows, the bees draw out the foundation in the center frames and fill it with honey. Additional supers are added as needed. Crystal and Ed Anderson are building a new bee yard. 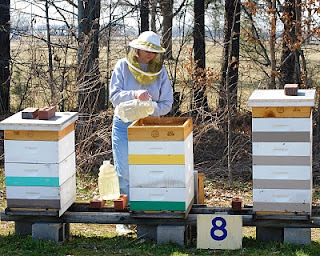 The eager beekeepers got off to a good start last year with one colony in their Tennessee back yard. They placed the hive behind a fence to isolate it from pets. Like many beekeepers, they started their colony from a package of bees and a mated queen. They watched the colony expand and build sheets of comb on foundation. The colony produced a surplus of excellent honey, which Crystal and Ed collected. They left the bees enough honey and successfully carried them through a colder than normal winter. After gaining experience working their own and other colonies, they decided to expand their beekeeping operation by adding a bee yard away from their home and a second hive next to the original. Having more than one hive gives them the advantage of having bees and brood to share between hives. Hive problems, like the loss of a queen, can be corrected by moving frames from one hive to the other as needed. To avoid conflicts, a bee yard is planned with human and animal neighbors in mind. An important consideration is access. Since bee hive equipment is heavy, the bee yard should be near a road, passable in all seasons. Sturdy hive stands are placed to provide good circulation of air. 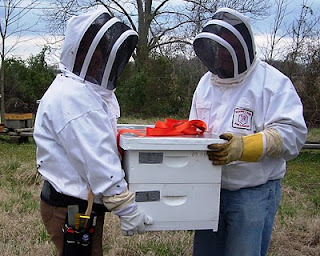 When possible, beekeepers face the hives toward the east or south. A clearing is preferable to an enclosed area in the woods. A bee yard in the full sun has fewer problems from Small Hive Beetles than one in the shade. Afternoon shade helps the bees cool the hive in the summer. An evergreen wind screen is helpful in the winter. 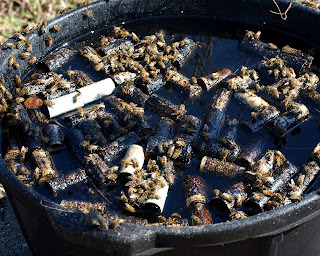 There should be a source of clean water within a quarter of a mile of the bee yard. The honey yield from the hives will depend in great part on the nectar sources in the area. Crystal and Ed move a hive to their new bee yard. The state of Kentucky is in the process of turning mountain lands of Appalachia that have been used for surface mining of coal into habitat for honey bees and native pollinators. The Kentucky Senate passed a pollinator bill that acknowledges current efforts to make mine reclamation more environmentally responsible by allowing pollination sites to be established on reclaimed land. The efforts also involve planting of trees and undercanopy plants that are attractive to bees and other pollinators. Among the trees being used for reforestation are sourwood and American chestnut. Bees make famous honey from sourwood grown at elevation in the mountains. The American chestnut is being restored after being decimated by blight in the 1900s. Not only are the Kentucky efforts restoring the foliage in the mountains, they are starting a beekeeping industry to provide economic opportunities in Appalachia. Among those who have been working to change the mine reclamation practices is Tammy Horn, who helped establish the Coal Country Beeworks. The Beeworks is training beekeepers and placing honey bee hives on former mining sites. The sites employed a type of mining known as mountain top removal, a technique in which rock and coal are removed without drilling mine shafts. Tammy Horn, the author of Bees in America: How the Honey Bee Shaped a Nation, wrote a piece in today’s New York Times about the honey bee. To read an interesting description of the evolution of our honey bee, its worldwide spread by humans, and its use by beekeepers visit http://www.nytimes.com/info/bees/. I congratulate Tammy and all who are working to restore pollinator habitat in Appalachia. They are helping the local economy while building a “honey corridor” in the region. 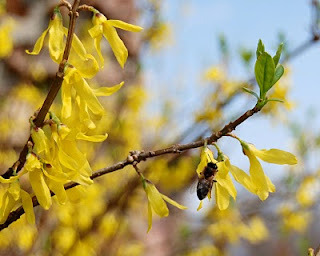 Today’s photo shows a honey bee collecting nectar from forsythia, an old-time favorite shrub and one of the first colorful plants to bloom in the late winter. The honey bees learn to access the forsythia’s nectary from the sides of the blossom, reaching the nectar between the flower petals. Throughout the world, nations are striving to improve people’s diet by increasing the variety of available foods. Much of the world lives on a diet based upon grains: rice, wheat, barley, sorghum, oats, and maize or corn. These plants are grasses which produce seed when they are pollinated by the wind. The world produces large volumes of foods derived from these grasses, but they often lead to a bland, starchy, and less than complete diet. As people try to move toward more nutritious and flavorful foods, farmers are growing increasing amounts of fruits, nuts, and vegetables. Many nations are also increasing the consumption of meats derived from domestic animals. In most cases the fruits, nuts, and vegetables are the product of flowering plants and trees which require insect pollination. The animal feed used to commercially produce domestic animals is also based upon insect pollination to produce the plants’ seeds. When we eat a hamburger or piece of beef or chicken, it comes from animals that were likely fed clover or alfalfa. The seeds for each of these legumes require pollination from bees. Almond nuts, one of the United States’ rapidly increasing agricultural export crops, require honey bee pollination. Human food crops are requiring greater numbers of pollinating insects. However, the pollinators are not increasing to meet the growing worldwide demand. Many of the bees and native pollinators are actually declining in numbers. The Cavallo family has been showcasing traditional Southern cooking in Memphis since 1943 at their restaurant, The Cupboard. The offerings at The Cupboard, which specializes in fresh vegetables, are the very items that we can thank the honey bees and native pollinators for helping to produce. 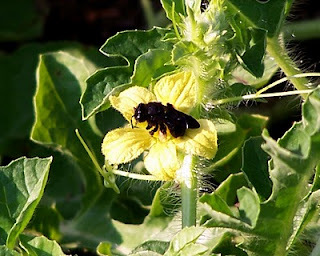 Without bees we would not have their eggplants, Crowder peas, turnip greens, and fried green tomatoes. Jereme Cavallo and Dory Sellers of The Cupboard visited Peace Bee Farm. That’s Dory in the bee suit. We are proud that The Cupboard chooses to offer our Delta honey to their loyal customers. Guelph, Wellington County, Ontario, Canada is making a name for itself by establishing the world’s first large habitat dedicated specifically to pollinators. The city of Guelph is building a 112 acre pollinator park on an abandoned landfill site, quite an imaginative re-use of land previously used to collect trash. The Canadian city recognizes the importance of pollinators and is creating a demonstration project to show how pollinator plantings can be created on either large or small scale. The Guelph project is intended to raise awareness of the role of pollinators and to teach pollinator-friendly planting techniques. Information about activities at Guelph is available at http://www.pollinator.ca/guelph/. With spring approaching, this is a good time to consider making any gardening or landscape planting an area to support pollinators. Very few modifications from traditional planting techniques are necessary. To be of great value to the pollinators, the planting should be planned to provide a continuous succession of blooming plants. A diversity of plants also helps assure that the honey bees, bumble bees, carpenter bees, solitary bees, and other insect pollinators receive good nutrition. Nesting habitat for bumble bees and ground-burrowing solitary bees can be provided by providing some bare, sandy soil. For a planting to be of use to pollinators, one should be cautious in the use of chemical pesticides. Today’s picture shows one of our native pollinators, the blue orchard bee. Here, it is seen pollinating a watermelon flower. Watermelon is one of the plants that is completely dependent upon insect pollinators to produce fruit. To provide nesting places for blue orchard bees, hang bundles of pithy-centered reeds or leave standing dead tree trunks. These solitary bees lay eggs in the hollow-stems of plants and abandoned beetle holes in dead trees. One third of our diet depends upon pollination from insects. The honey bee is the principal agricultural pollinator. Its natural home is a cavity in a hollow tree. Beekeepers house the honey bee in modern wooden hives that replicate hollow trees. One of the simplest methods of feeding honey bees is the use of common feeding stations. These are containers of food placed in the open for the bees to find and feed upon. The common feeding of bees is simple for the beekeeper. A large amount of food can be placed near the bee yard fairly rapidly. The food that the beekeeper provides may mean the difference in a colony starving or surviving until natural sources of nectar and pollen become available. Placing pollen substitute in a pet feeder inside a five gallon pail is one form of common feeding. The pail, facing the east, provides protection from the weather. The common feeding of pollen substitute is a source of protein, and the queen is stimulated to lay eggs when pollen is brought into the hive. Syrup, either sugar or high fructose corn syrup, may also be fed to bees in a common manner. Syrup is merely placed in a container in the open. To prevent the bees from drowning, floats need to be placed in the syrup for the bees to rest upon while they are drinking and preening. Some beekeepers use hay or straw; I use old wine bottle corks. Common feeding of syrup has some draw-backs that need to be considered. Bees sharing common feeding may spread some diseases, particularly Nosema, from colony to colony. More contamination, however, probably occurs from bees drifting into the wrong hive. Common feeding does not always provide equal food to each hive, and weak colonies may not receive enough of the food. The bees can only access syrup in the open in fair weather, and some of the bees being fed are from feral colonies or distant bee yards. Common feeding of syrup can encourage robbing behavior, and entrance reducers should be used to give the guard bees an advantage. Fumagillin, a treatment for Nosema disease, should not be applied in common feeding, because it is broken down by the sun. Honey bee colonies are fascinating. Many consider the honey bee colony as an organism, not the individual bees; since individuals cannot survive alone. Honey bees only exist in colonies where they share responsibilities for food gathering, hive protection, care and feeding of the young bees and many other tasks. The colony even has a small number of bees devoted to reproducing the entire colony. These are the queen and the drones. The study of these fascinating social insects is an introduction into many of the natural sciences. I received a message today from a sixth grade student in Texas whose class is studying honey bees in school. Many of the readers of these blog posts are students from around the world who share an interest in the honey bee and an appreciation of the complex honey bee colony. One of the places that children are first exposed to honey bees is The Children’s Museum of Memphis. Peace Bee Farm has bee hives on exhibit where children can see the bees through large windows. 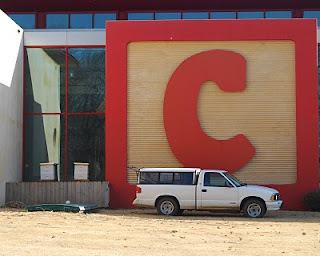 In the picture you can see my hives and beekeeping truck dwarfed by the block letter “C” on the front of the museum. The honey bee exhibit is the idea of The Children’s Museum of Memphis’ Chief Executive Officer, Richard Hackett, a beekeeper himself. Mr. Hackett often interrupts his activity to look into the hives when I visit to inspect them. While the honey bee is quite the subject of educational study, The Children’s Museum of Memphis accomplishes learning experiences through play and hands-on exhibits and programs. Children don a beekeeper’s veil to watch the honey bees through a glass window. The museum is currently hosting the world premiere of a traveling exhibit, “Harry’s Big Adventure: My Bug World!” My favorite part of the exhibit is a kitchen sink. When you open the cabinet doors, the sink is full of live cockroaches. Like the honey bees, they are safely housed behind glass. Follow museum activity at http://www.cmom.com/. The majority of the winter honey bee colony losses are due to starvation. Hives that are low on stores of honey can be fed syrup as a survival measure. The bees are now in a critical period with populations growing and food consumption expanding. Warming weather allows the bees to leave the hive more frequently, and the increased activity consumes greater amounts of stored food. A few bee plants are starting to bloom, but there is not yet a great flow of nectar and pollen. Food in the form of syrup can be fed inside the bee hives at this time to help ensure survival. The syrup can be either sugar or high fructose corn syrup. We generally feed a thin syrup in the early spring rather than a more concentrated syrup like is fed in the fall. The thin syrup is similar to the carbohydrate in the nectar of flowers. The availability of this diluted syrup stimulates the worker bees to scout for food outside the hive. Early in the year the bees will travel great distances to find red maple, elm, skunk cabbage, henbit, dead nettle, and dandelion. Much of their early-season forage is found in river bottoms. Henbit, dead nettle, and dandelion are extremely valuable bee plants available in lawns that are not treated with herbicides. Medications needed to control honey bee conditions, such as Nosema disease, can be applied in syrup fed in the late winter and early spring before supers are added to collect spring and summer honey. To ensure the medicated syrup is taken up rapidly by the bees, a feeding stimulant containing essential oils is added to the syrup. A new strain of Nosema has been identified as one of the possible contributing factors in Colony Collapse Disorder. Rita is feeding medicated sugar syrup flavored with essential oils of lemon grass, peppermint, tea tree, and wintergreen to a colony of bees that will be used to produce queens later in the spring. Citizens across North America are planting sunflowers and counting bees visiting the flowers. These citizen scientists are participating in a study of the populations of honey bees and native pollinators. Scientific investigations are based upon observations, and the greater the number of observations that can be made, the more meaningful the results can be. The Great Sunflower Project is looking for the locations of bees and pollinators in North America. Of particular interest are the locations where bees are absent. The project relies upon thousands of participants who each plant the same variety of sunflower plant and then count the number of bees that visit the blooms. The flower in use is the Lemon Queen Sunflower, a plant that is highly attractive to bees. The beauty of the project is its simplicity. The hearty sunflower is among the easiest of annual flowers to grow. The seed is inexpensive, and people of all ages can participate. This enjoyable project produces bright flowers in the yard or garden. The Great Sunflower Project is also a good introduction to individuals everywhere to the importance of bees and native pollinators. The sunflower planting can be the start of each person’s pollinator garden. With spring approaching, the time is right to participate in The Great Sunflower Project. Seeds can be ordered now, and they will arrive in time to be planted as soon as the soil is adequately warmed. When the plants produce flowers, you are ready to report the bee visitors. The colorful blossoms are highly attractive to numerous species of bees. The planting of great numbers of pollinator gardens can be the quickest method for reversing the decline of pollinators. Those who participate will be eager to learn techniques for maintaining lawns, gardens, golf courses, and farms in a manner that provides food and habitat for the pollinators. Visit The Great Sunflower Project’s web site, http://www.greatsunflower.org/, to participate. 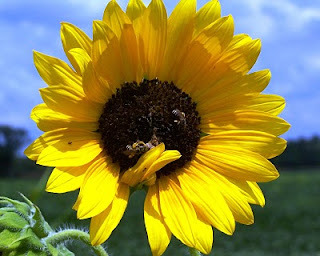 Click on today’s photo to see solitary native bees collecting pollen from a sunflower. Of course, wild geese and honey bees can fly. Other than the fact that they both are capable of flight, they have little in common. However, both have evolved a strategy for survival based upon their mobility. The Arkansas Delta sees thousands of migrating snow geese in the winter. The ability to fly many hundreds of miles to their winter feeding grounds allows the birds to survive when their summer home is covered in ice and snow. The geese are able to thrive on the spilled grain from mechanical harvesting of agricultural fields as well as the dormant, green shoots of cool-weather crops, like winter wheat. The abundant winter forage allows the geese to return in the spring to their nesting grounds in a healthy condition. With good nutrition the birds have high survival rates for their offspring. 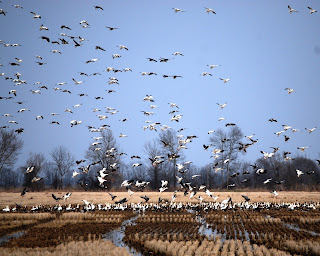 Click on today’s photo to see a flock of snow geese feeding in the stubble of a Delta rice field. The flock includes both the black and white snow geese and the dark gray color phase of the same species, the blue goose. The gregarious birds often cover the ground, giving the appearance of dirty snow. The honey bee also takes advantage of its mobility to survive by flying to various available flowering plants as they come into bloom throughout the year. A single colony will typically fly two and one half miles in every direction to forage an area of about nine thousand acres. They are able to pass from one species of flowering plant to another as these plants come into bloom throughout the year. It takes quite a large amount of forage to feed a flock of snow geese or a colony of honey bees. Neither would be successful if they were not able to move to the available food. For the honey bees to produce one pound of honey, the bees must fly a combined distance of 55 thousand miles, more than twice the distance around the world. Recent years have highlighted the need for good nutrition in the bee hive. Supplemental feeding of heavy syrup in the fall was often done to provide extra stores of food for the winter. A feeding of light syrup in the spring was used to stimulate foraging to support the build-up of the honey bee population prior to the major nectar flows. Now, there is considerable interest in providing a more complete diet to the honey bee colony throughout the year. Not only are beekeepers feeding carbohydrate syrups to supplement nectar, they are feeding pollen substitutes to provide proteins, fats, vitamins, and minerals. When honey bees have available honey and pollen from a diverse array of plants, they have complete nutrition. Mono-culture agricultural practices, migratory pollination work, the clean-up of weedy areas, and adverse weather may each lead to nutritional stress on the bees. Feeding pollen to bees in the fall helps insure that the young bees will have fully-developed glands necessary for them to make the brood food needed in the late winter and early spring. 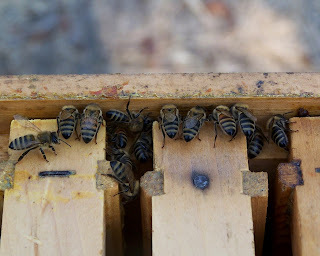 The queen is stimulated to start laying eggs when the workers bring pollen into the hive. For this reason I like to place some dry pollen substitute in a feeding station in the bee yard where I will be raising queens. Supplemental feeding of pollen can also be done inside the hive by making patties of pollen substitute and syrup. These patties are useful for feeding the brood during build-up. They should be placed directly above the brood nest. If the patties are not consumed rapidly by the honey bees, small hive beetles are attracted to their protein. The picture shows a simple arrangement for feeding dry pollen substitute. A pet feeder is placed inside a five gallon pail, which is open toward the east. The feed is pollen substitute mixed with natural pollen that I trapped and froze last summer. Some powdered sugar is added as well. Bees love this mix.